The following skin care brands are available to patients in our Issaquah, Wa location. 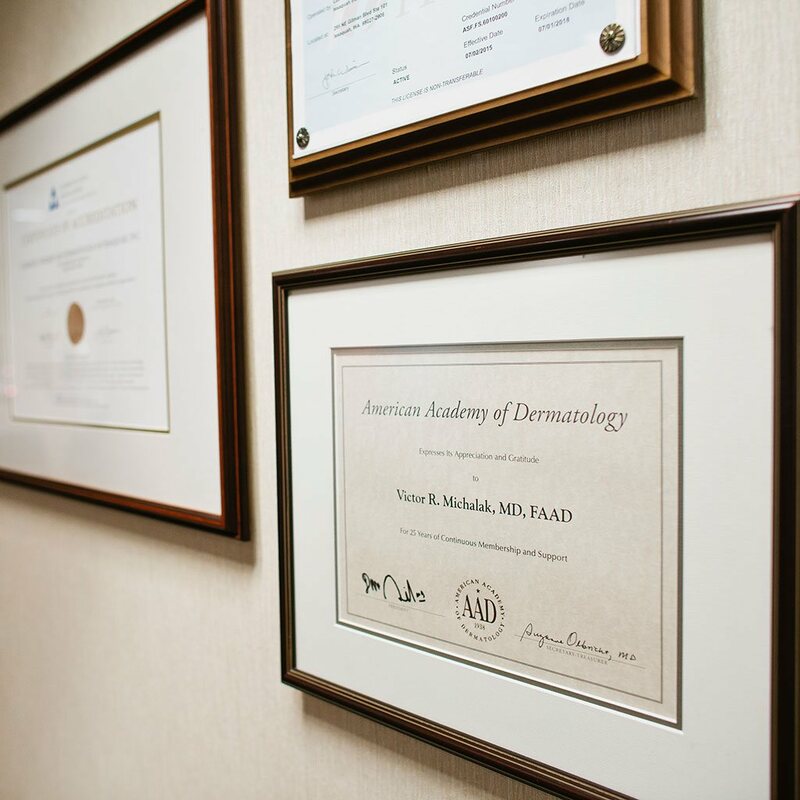 Dr. Michalak, Certified Physician Assistants Emily Nardiello, Elizabeth Wood, Debbie Gauthier, NP and Licensed Master Aesthetician Leslie Carney all routinely recommended skin care to help patients meet their skin health goals. Leslie offers complimentary comprehensive skincare consultations for patients adding skin care with their treatments or stand-alone. DCL (Dermatologic Cosmetic Laboratories): Uses the highest grade ingredients to create effective skin care with innovative ingredients. DCL is a popular choice for patients seeking a simple skincare program with an attractive price point. Products we carry: AHA Resurfacing Lotion 8 and AHA Resurfacing Lotion 20. EltaMD: A dermatology favorite, EltaMD is a line of sunscreens formulated with transparent zinc oxide having UVA/UVB broad -spectrum coverage. All sunscreens are noncomedogenic, sensitivity-free, fragrance-free, and paraben-free. The sunscreens glide on the skin without feeling heavy or looking like you’re wearing a white mask. Products we carry: UV Clear, Broad-Spectrum SPF 46 facial sunscreen, UV Daily, Broad-Spectrum SPF 40 tinted facial sunscreen and EltaMD UV Lotion Broad-Spectrum SPF 30+, full body sunscreen. Glytone: One of the first companies to pioneer glycolic acid when it rose to popularity in the 90’s. Glytone was started by two pharmacists in collaboration with a dermatologist. The originator of what is called “Free Glycolic Acid Products.” Glytone is a good choice for patients seeking exfoliation and for most skin types including acne. Products we carry: Mild Gel and Mild Cream Cleansers. NeoStrata: Created by two internationally recognized dermatologists who discovered that Alpha Hydroxy Acids (AHAs) have a profound effect on human skin. They found using AHAs, Glycolic Acid and, Lactic Acid for dermatologic conditions stimulating the damaged skin to repair itself. NeoStrata is good for patients with photodamaged skin and acne. Products we carry: Foaming Glycolic Wash, Bionic Lotion, and Bionic Face Cream. Refissa: Is a prescription retinoid for the treatment of fine lines, wrinkles, sun damage, and hyperpigmentation. Also called tretinoin, this vitamin A derivative is considered a gold standard treatment. A prescription is necessary but dispensed by our office for patient convenience. SkinCeuticals: Founding scientist Sheldon Pinnell MD developed the first stabilized pure L-ascorbic acid for topical use thus revolutionizing the use of antioxidants in skin care. SkinCeuticals has extended this concept creating a respectable portfolio of effective, active products. We also offer in-office treatments, Dermaplaning and the Micropeel to improve skin texture or maintain results from other treatments like Fraxel, Fortified Fraxel Facial, and microneedling. Products we carry: C.E Ferulic®, Phloretin CF®, A.G.E Interrupter, A.G.E. Eye Complex, Triple Lipid Restore 2:4:2, Sheer Physical Defense SPF 50, and Physical Matte UV Defense SPF 50. SkinMedica: We use SkinMedica peel systems and find the Vitalize Peel to be one of the best peels out there for a wide variety of cosmetic skin concerns. The Vitalize peel is effective for patients with hyperpigmentation, sun damage, and acne. SkinMedica is part of the Brilliant Distinction program offered here in our office. Skincare products are available in our Issaquah office. Because we carry cosmeceutical skincare, a consultation is required to purchase products and can be easily schedule by calling the office @ 425-391-2500.